Accident Attorney Corpus Christi: Call Us Now for Car Accident Help! Driving a car is something most people do every day. It can easily become second nature, and if you drive many miles to and from your job, it can be tempting to become distracted by other activities that seem more pressing. We’ve all seen those drivers roaring down the interstate putting on makeup, reading the morning paper, or enjoying a cup of coffee and a breakfast sandwich with both hands. While you may not be as extreme as some of these motorists, taking every precaution to always keep your hands and eyes on the road is vital to your safety, as well as the safety of fellow drivers. Arrive to your destination securely and try to avoid these 10 distractions as best as you can. The Law Offices of Alex R. Hernandez Jr., PLLC are dedicated to giving you the best legal advice and service in Corpus Christi and Victoria , Texas. If you have been involved in a car accident and are in need of legal help, call us today! We are all guilty of chatting with a friend or family member on the commute home from work. Unfortunately, these devices are the cause of many accidents because they divert a driver’s attention from safe driving. If you find yourself struggling to ignore calls from family members, friends, or coworkers, turn your phone off or place it airplane mode before starting your car. If you need to have your phone on for something like navigation purposes, there are several phone apps that can send an informative text message saying that you’re driving and can’t answer your phone calls to those who try to contact you. You may think that this is a viable option for taking calls, composing emails, and responding to text messages via your headset or headphones that connect to your cell phone. Sadly, this doesn’t remove much of the distraction. Talking to your husband about vacation plans still requires your attention, and the more that you daydream about the white sandy beaches you’ll be on in a few months, the less your mind stays on the road in front of you and the traffic stop coming up. The average of time that your eyes are on your phone composing a text message instead of on the road is five seconds. This is the same amount of time that it takes to drive the length of a football field traveling at 55 m.p.h. Here in Texas, more than 44 cities have banned texting while driving, but there is no statewide ban. Check to see if texting and driving is banned in your city, but even if it’s not, stop this habit immediately. It’s extremely dangerous and the text can definitely wait until you’ve arrived at home or work. Sipping that morning cup of joe while on the way to work may need to wait until you arrive at the office. If you’re surprised that it’s a distraction, think about it for a second. It requires you to take one or both hands off of the wheel and your eyes off the road. Even if it’s just a few seconds, those few seconds of distraction could cause you to cause a car accident. Even though chowing down on a yummy burger while commuting home may not seem like a big deal, you need to wait until you’re sitting at your kitchen table to eat dinner. Chatting with your kids or discussing weekend plans with a friend is fun and enjoyable, but make sure to keep both your hands on the wheel and eyes on the road. This is particularly an issue for teenage drivers and is the cause of many auto accidents every year. If you’re concerned about your teenage driver becoming distracted by having passengers in his or her car, require that the first six months or so that he or he has a license to only drive solo. This may seem harsh, but you don’t want to put your son or daughter at risk for possible accident. Practicing safe driving is one of the most important things you can do, and imparting that awareness to your son or daughter as he or she starts driving will give him or her the necessary tools to make good choices while behind the wheel. Personal grooming has become increasingly popular as commuting to work takes longer and longer. Even if you’re running 15 minutes late and have an important meeting that morning and need to look presentable, applying mascara or shaving while driving to work isn’t work getting in an accident. Looking in your rearview mirror in traffic to apply eyeliner can cause a fender bender and mess up eye makeup. Wait until you can finish your grooming in a bathroom at work, not driving your car. Solving the world’s problems is always a riveting subject, but trying to find a cure for the common cold on the way home might not be the best idea. As soon as you descend into the depths of thought, your attention diverts from the road and cars in front of you. Don’t make the mistake of being unfocused and causing an accident. Keep your mind on your drive home. Many manufacturers try to make these systems less demanding and even hands-free, but operating your GPS while driving is highly distracting. If you’ve accidentally keyed in the wrong address or location, reaching over to adjust the navigation takes your eyes and hands off of the road in front of you. Pulling over can seem like a major pain and even divert you from your course, but those few extra minutes that you take to edit your destination are worth it. Cars nowadays have so many gadgets and options: seat heaters, satellite radio, navigation, cruise control, etc. While these help make your car ride more enjoyable and comfortable, trying to find that one jazz radio station may take your eyes off of the road right as a car pulls out in front of you. Try to make all adjustments before you pull out of your parking place or garage, but if you have to change something, wait until you’re at a complete stop. Trying to grab a dropped pen or CD requires you to take at least one hand off of the wheel. Make sure to secure all loose items before you back out, especially if they’re in the front seat with you. and if you do If you truly need that fallen object, pull over to a safe place to retrieve it. Practicing safe driving habits is extremely important to your safety, as well as the safety of other drivers and passengers. 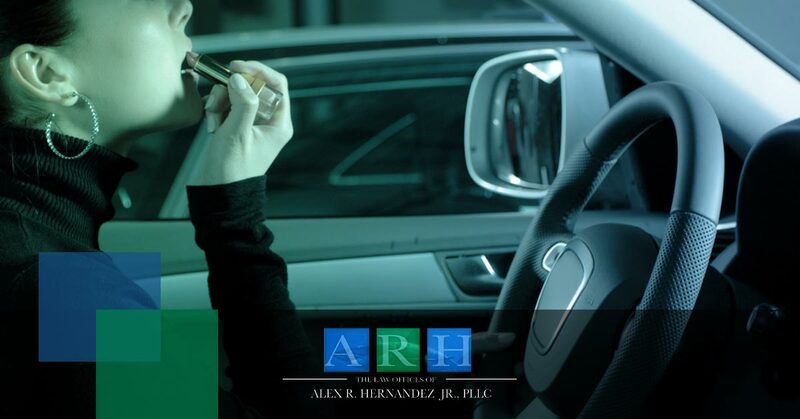 If you believe that you have been injured in a car accident that was caused by a distracted or negligent driver, contact The Law Offices of Alex R. Hernandez Jr., PLLC. Our experienced and compassionate attorneys can review your case and give wise legal counsel and advice. If you’re in the Corpus Christi or Victoria area, call us today!